Professor Juiry W. Wladimiroff was born in The Hague in 1939. From 1921 his family moved to Java (now Indonesia) and in 1931 moved back to Holland and settled in The Hague. He graduated from the school of medicine in Leiden in 1965 and was Board certified in Obstetrics and Gynecology in 1972. As a resident Gynaecologist in the late '60s, he was already aware of the potential usefulness of ultrasonic investigations in the human after pursuing publications from the Joseph Holmes group at Denver and seeing A-mode scopes at work at his hospital's neurology department. After some initial endeavours, Wladimiroff soon went down to London to study with Professor Stuart Campbell at the Post-graduate Institute at the Queen Charlotte's Hospital. In the late 1970s he field tested Organon Teknika's original real-time equipments from the Netherlands (in collaboration with Nicolaas Bom, the original inventor) and demonstrated the usefulness of the MiniVisor in the rapid measurement of the biparietal diameter at the bedside. His research at Queen Charlotte's started with the measurement of fetal urinary production rate, which he continued to expand after returning to the Netherlands, looking at fetal urinary production under a variety of physiological and pathological situations. From then on Professor Wladimiroff became particularly interested in the physiology and patho-physiology of pregnancy and the fetus and his group was very productive in researches pertaining to fetal cardiology, fetal vascular and cerebral function and fetal blood flow as assessed by doppler velocimetry. 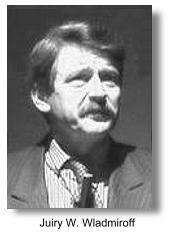 In 1974, he received his PhD at the University of Nijmegen with a thesis on fetal monitoring. In 1973, he started work as a consultant at the department of obstetrics and gynecology of Erasmus University Rotterman at Dijkzigt Hospital; in 1977, he was appointed reader at this department, and in 1980 full professor. Since 1984, he was head of the division of prenatal diagnosis and since 1996, when the two divisions were merged, head of the division of obstetrics and prenatal diagnosis at Rotterdam University Hospital. In 1981, his group reported fetal left ventricular volume determination from a study of two-dimensional measurement of real-time ultrasonic images of the left ventricle. Their group was the first to describe doppler studies of the middle cerebral arteries and the carotid carteries, and popularizing the carotid artery/ umbilical artery PI ratio for the assessment of fetal compromise. His studies not only spanned the first to the third trimesters but often involved animal experimentation to clarify certain physiological uncertainties. His later research activities included the study of fetal behavioural states, cardiovascular hemodynamics, pulmonary blood flow, first trimester flow velocimetry and the early diagnosis of congenital anomalies, all ground-breaking research into fundamental fetal patho-physiology. Professor Wladimiroff was the President of the Dutch Society of Obstetrics and Gynecology from 1993 to 1995 and was the Chairman of the National Liason Committee for Medical Research Committees in the Netherlands. He has organized numerous National and International Scientific meeetings and Symposia and was the Chairman of the Education Committee of the International Society for Ultrasound in Obstetrics and Gynecology (ISUOG). He is also a board member of the Society of the "Fetus as a Patient" and executive board member of the European Board and College of Obstetrics and Gynecology and has carried out visitations in departments from Slovenia to Portugal. Professor Wladimiroff has produced over 300 important scientific papers and contributed to over 20 books and monographs. He is well regarded by his colleagues as a great teacher and investigator. Since 1977, he has supervised 25 PhDs on many different aspects of prenatal diagnosis, of obstetrical, gynecological and Doppler ultrasound, and of fetal monitoring. His PhD students came from Holland, Switzerland, Britain, Indonesia and Austria. In recognition of his contributions to the advancement of ultrasound in Obstetrics and Gynecology, he was presented the Ian Donald Gold Medal by the ISUOG in 1997. In 1999 he received the Gold Medal from the Drs. Haackert Foundation for "Lifetime Achievements in the field of Prenatal Diagnosis and Therapy". Image courtesy of the OBGYN.net.